﻿A high-speed car chase between a Dodge Charger and a Ford Mustang, with super-cop Bullitt at the wheel, who forces the hitman off the road and into a petrol station, which explodes and incinerates him. Prior to that, harsh clashes of metal, hubcaps flying all over the place, and the chief character Steve McQueen, who grimly changes gears and hurtles through the streets of San Francisco, wheels screaming and rubber burning. That was how Hollywood staged one of the longest and most dramatic car chases, long before the days of the Anti-Blocking-System and Anti-Slide-Control. Very up-to-date and just as exciting as the screenplay is the music Lalo Schifrin wrote for the film, which embeds the characters, places and events in a musical context. 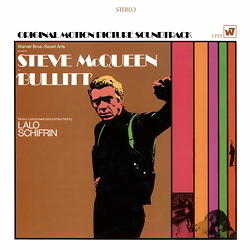 For example, "Bullitt": the metrically angular main theme portrays a mysterious, cool character who sums up a situation with keen alertness and then makes his attack with the speed of lightning. Initially the music travels through easy-going Latin terrain. But gradually the rhythmic texture changes and takes a rougher path, with clicks, knocks and hammering. Legendary flute lines create a compensatory placidness with airy clouds floating above the sharp mix. A really special track is "Shifting Gears": here you can listen to Schifrin tuning the car, how he manipulates a jammed springy bossa to take on the sound of clean, smooth-running rock.